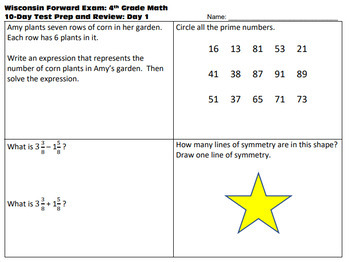 Wisconsin Forward Exam Prep - 10 Days of Review for 4th Grade MATH - NO PREP! 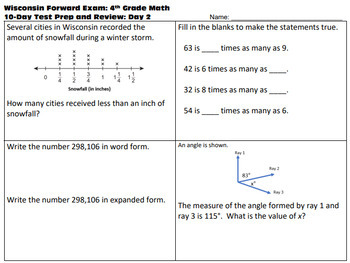 This 10-day packet is designed to be used over the course of two weeks prior to the 4th Grade Wisconsin Forward Exam, giving students 4 questions per day to practice and then review as a class to support testing strategies and understanding of concepts. The questions in this packet are based on previously released questions for the Wisconsin Forward Exam and the Wisconsin standards as listed on the Wisconsin Department of Public Instruction website. 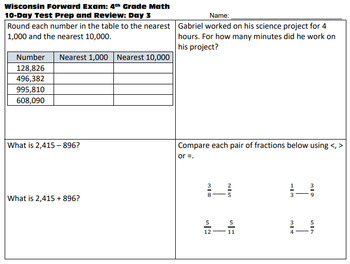 This packet can also be used as centers, homework, or assessment readiness. I often use test prep packets as a way for students to work with each other to share testing strategies, as well as whole-class review. Thank you for purchasing! Please follow my store. 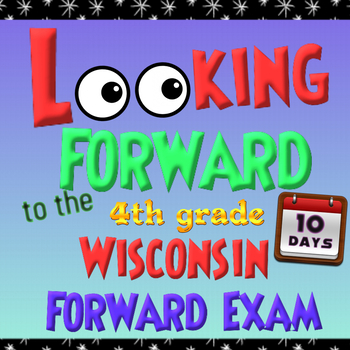 I will soon be uploading more new materials to help students prepare for the Wisconsin Forward Exam.